Most people associate sweet potatoes with candied Thanksgiving casseroles or equally sugary sweet potato pies. And have you noticed that almost every restaurant nowadays serves sweet potato fries in addition to their standard white potato fries? While I’m all for healthier food swaps (is there really a healthier french fry? 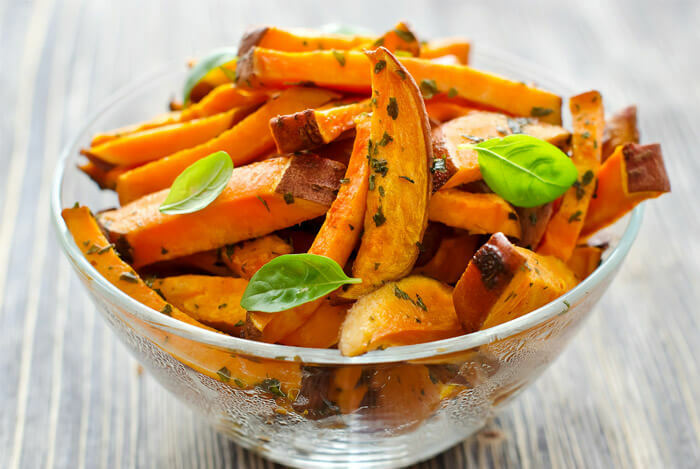 ), the truth is, sweet potatoes have so many health benefits that they shouldn’t just be compared with white potatoes as a french fry substitute. Sweet potatoes are loaded with vitamins, minerals, and even antioxidants. 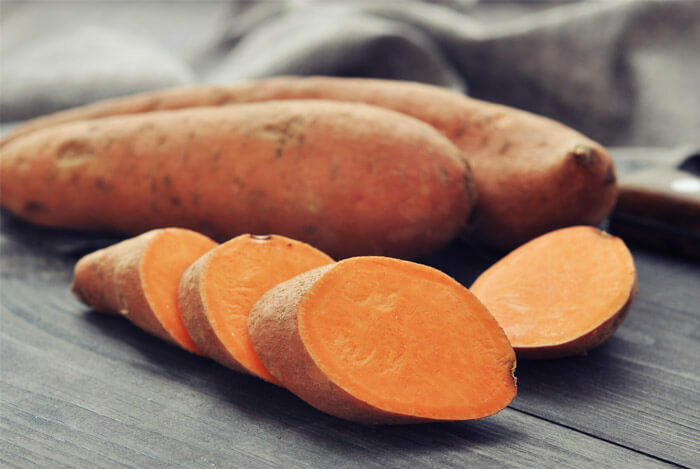 Today I want to share some surprisingly awesome nutritional benefits found in sweet potatoes that you may not have known about. For example, sweet potatoes are often synonymous with yams, but that’s actually incorrect. 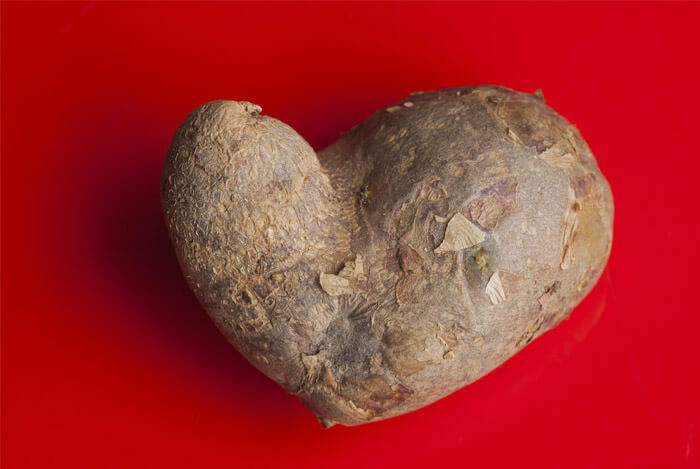 Yams are a totally different species and only grow in Africa. Sweet potatoes are moist and sweet; yams are dry and starchy. Another bit of confusion arises because people believe there’s too many carbs in sweet potatoes and choose to avoid them. But this is also very wrong. Aren’t Sweet Potatoes High in Carbs? One medium-sized sweet potato has 27 g of carbs, which is a bit higher than most veggies. The carbs in sweet potatoes break down into sugars and starches, 32% of the carbs in sweet potatoes come from simple sugars (think: fructose, glucose, sucrose), while 53% of their carbs come from starches. Because of this, sweet potatoes have a relatively medium to high rating on the glycemic index (GI), which measures how foods cause blood sugar levels to rise. They rank anywhere between a 44 and 94 depending on variety and cooking method. Keep in mind that the GI goes from 1 to 100, with foods that raise blood sugar levels on the high end of the scale. You can see why the range for sweet potatoes is so confusing; a 44 isn’t too bad, but a 94 is almost like eating white rice or a refined baguette. The reason sweet potatoes rank so high with GI is because they’re mostly made of rapidly digested starches (around 80%). There are three categories of starches and they’re differentiated by the way they work in our bodies during digestion. For most healthy people, they’re an excellent choice. So now that we know the real breakdown of carbs in sweet potatoes, let’s get to some of the better nutritional benefits associated with these tasty tuberous roots. Here are 13 healthy reasons to add some sweet potato to your diet. 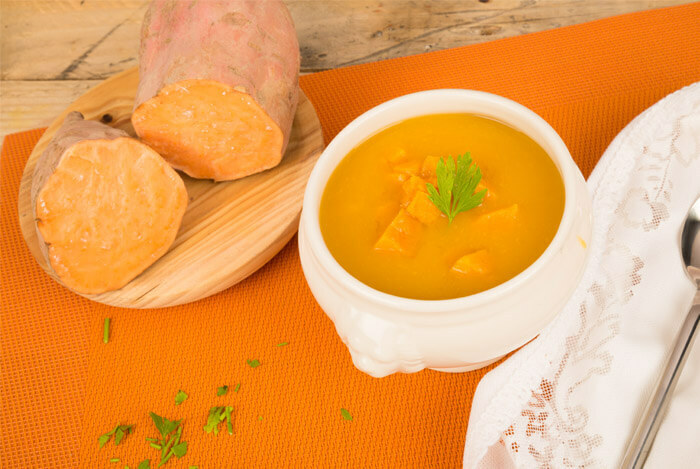 As you can probably tell from their characteristic orange color, sweet potatoes are high in beta-carotene, an antioxidant that the body converts into vitamin A. One medium baked sweet potato has 438% of your vitamin A intake – 23767 IU! “A number of studies show that people who eat lots of fruits and vegetables that are rich in beta-carotene and other vitamins and minerals have a lower risk of some cancers and heart disease”. High levels of vitamin A have even been associated with a reduced risk of developing gastric cancer. You’ll also find beta-carotene in other (orange colored) pigmented fruits and veggies like carrots, winter squash, apricots, and cantaloupe. Most people know vitamin A as being beneficial for keeping our vision strong, and it’s especially helpful for our vision in low light conditions. But “vitamin A helps form and maintain healthy skin, teeth, skeletal and soft tissue, mucus membranes, and skin” too. 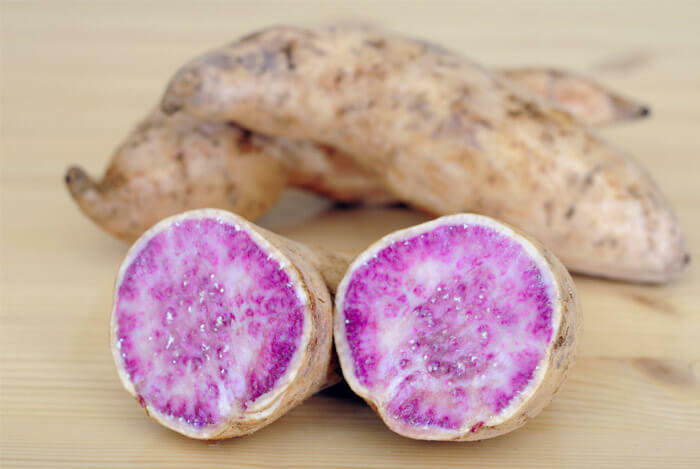 The deeper the color of a sweet potato, the more beta-carotene your eyes and body will be enjoying. 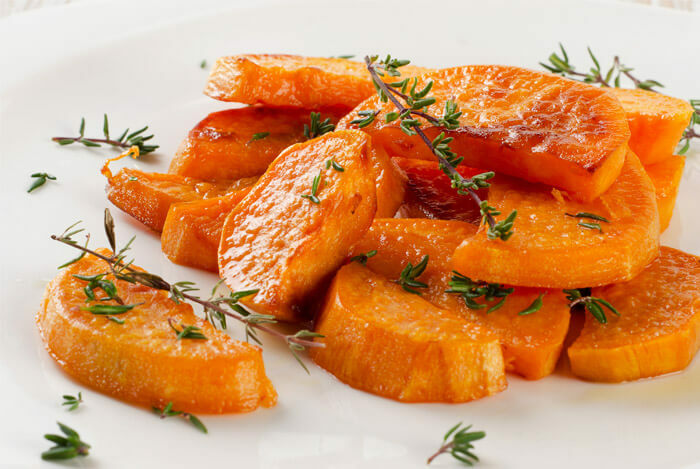 Orange and yellow versions contain more vitamin A than other varieties (yes, there are white sweet potatoes!). Just one cup of baked sweet potato has 6.6 g of fiber. We know that most Americans eat less than half of their recommended daily fiber intake, so sweet potato is an excellent choice to raise those levels. 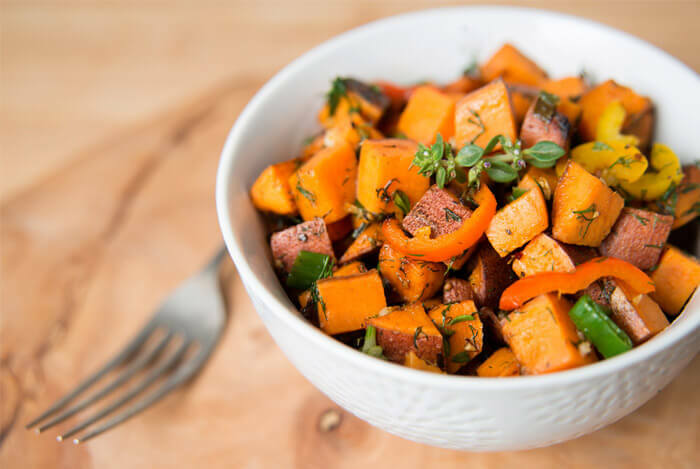 You’ll have a bit of soluble fiber (around 23%) to help keep you feeling full, but sweet potato’s fiber is mostly insoluble fiber, which means it helps your digestive system move along smoothly by adding weight to your system’s waste. To get the most fiber from your sweet potatoes, keep the skin on when you eat them. Make sure to scrub them clean before baking and you’ll enjoy a crunchy, healthy fiber alongside the sweet, creamy flesh. One cup of baked sweet potato has 65% of your vitamin C for the day – 19.5 mg.
We all know that vitamin C is crucial for keeping our immune system in tip-top condition, but this immunity booster is also helpful for lots of other functions in our body. For example, vitamin C helps with bone and tooth formation and even plays a role in forming blood cells. Not to mention that vitamin C has been known to increase collagen production so your skin looks supple and wrinkle free. Current research claims that vitamin C has even been called a natural sunblock because it prevents the sun’s harmful rays from damaging our skin. While our bodies love grabbing vitamin D straight from sunlight, we can also round some up by noshing on sweet potato. Without adequate levels of calcium and vitamin D, our bones start to become brittle and may be prone to breaking easily (ouch!). 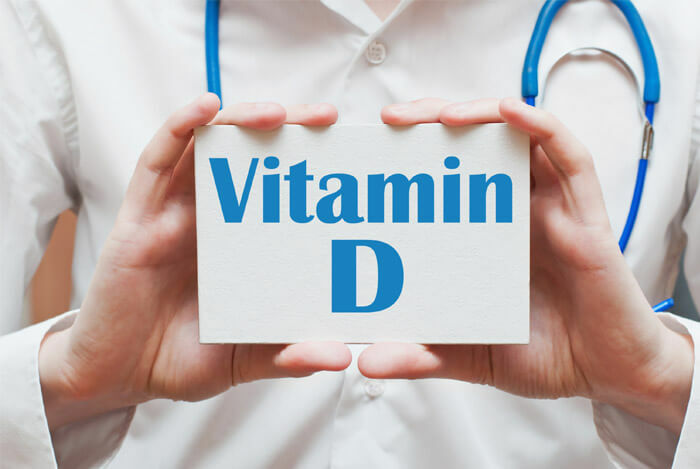 But vitamin D is also crucial for regulating the development and function of the nerves in our nervous systems. This powerful electrolyte performs a ton of functions in our bodies. It regulates our heartbeats, helps relax muscle contractions, and even reduces swelling. Potassium is also important for keeping our blood pressure down, which is especially critical for those suffering from hypertension, or high blood pressure. Typically, the banana is considered king of potassium, but guess what? Studies show that increasing potassium levels reduces blood pressure for those dealing with hypertension and even lowers risks of strokes by 24%. Manganese is a mineral that’s integral to the performance of enzymes that metabolize carbs, proteins, and fats. You can find good sources of manganese in foods such as pineapple, spinach, and sweet potatoes. At 28% of your daily manganese value, sweet potatoes are a good source. Our body is constantly fighting off oxidation and free radicals that damage our cells. The more damage we have, the more at risk we become for developing serious health issues like cancer. Dark fruits like blueberries are one of the best antioxidant powerhouses, and the same goes for these purple potatoes. I don’t know how good purple sweet potatoes will be in smoothies or yogurt parfaits, but I’m definitely going to be on the hunt for them. Sweet potatoes house vitamin B5 and vitamin B6, both of which can’t be better for you. It’s safe to say these B vitamins are A+ for our health. Sweet potatoes don’t have to be the unhealthy side dish you know (and still love). 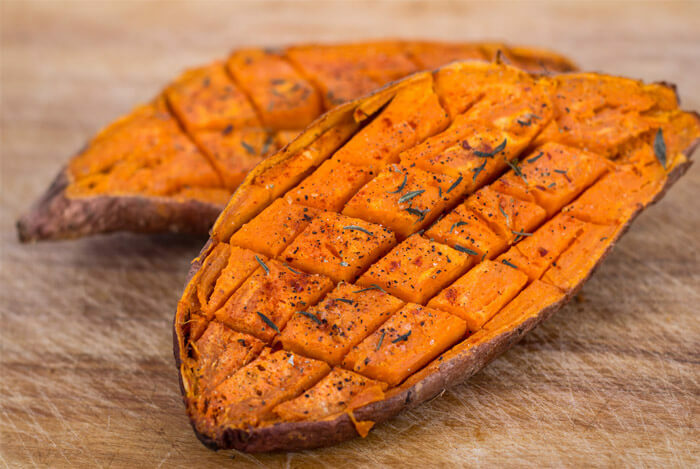 A medium-sized baked sweet potato with skin on will only set you back about 100 calories! Whether you top that sweet potato with a bit of butter and cinnamon, or pour some veggie chili over it for a satisfying, healthy lunch, you’re going to have a tasty treat in your belly that will keep you feeling full. Who wouldn’t want that from something so easy and inexpensive? Whether you’re eating sweet potatoes to replace your white potato addiction (the struggle is real when mashed potatoes are on the menu! ), or adding them to your vegetarian and vegan bowls for beautiful color, fiber, and protein, know that you’re making an excellent decision for your health. What’s your take on sweet potatoes? Have anything else you’d like to share? Let me know in the comments below!